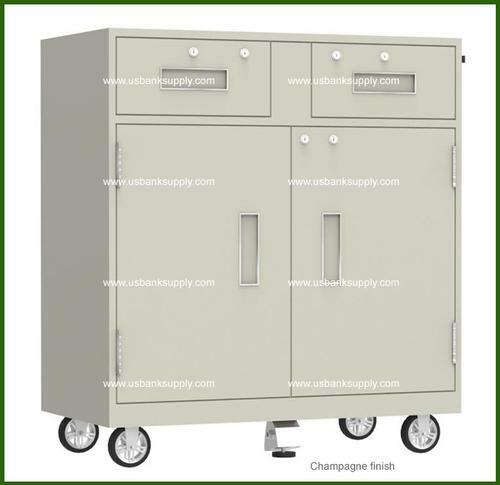 Our two drawer one cabinet mobile teller truck comes with 2 easy glide drawers, a lower storage compartment with adjustable shelf, recessed door and drawer handles and a side pull handle, 5" casters: 2 fixed and 2 swivel and a compression break to hold the unit in place when required. Available with single or dual locks in flat key, combination or electronic. Dimensions: 38-1/2"H x 36" W x 19" D. Wt. 300 lbs. Choice of 9 finish colors. Our two drawer one cabinet mobile teller truck comes with 2 easy glide drawers, a lower storage compartment with adjustable shelf, recessed door and drawer handles, a side pull handle, 5" casters: 2 fixed and 2 swivel and a compression break to hold the unit in place when required. Available with single or dual locks in flat key, combination or electronic. Dimensions: 38-1/2"H x 36" W x 19" D.